Any Bong Joon-ho movie is worth getting excited about. But when it’s about a little girl trying to rescue her best friend, a best friend that just happens to be a giant pig monster, it has my full attention. The Korean auteur’s latest premieres at Cannes tomorrow, and Netflix dropped a wonderful new trailer for Okja. Okja is going to make me cry, isn’t it? Okja looks cute and cuddly and thrilling and weird as all hell. Tilda Swinton appears deliciously evil as the head of the Mirando Corporation, who wants to use Okja and his ilk as a cheap, tasty food source. She also reportedly plays twins; a task she’s undertaken on screen before. Jake Gyllenhaal is positively unhinged as a zoologist and nature show host. And Paul Dano is obviously up to no good even though he purports to be on the side of the young heroine (Ahn Seo-hyun). Lily Collins, Steven Yeun, Devon Bostick, Daniel Henshell, Shirley Henderson, and Giancarlo Esposito round out the rest of the fantastic cast. 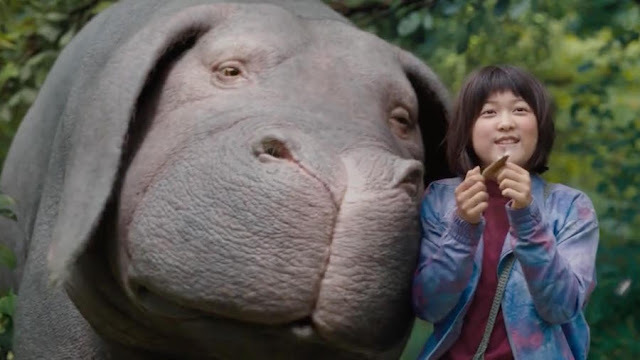 Okja marks Bong Joon-ho’s second consecutive English-language picture, after Snowpiercer. And while he’s not working in his native tongue, he’s still shifting gears and doing different things with each successive movie, as he’s done his entire career. In addition to the fact that he makes incredible movies, that’s part of why he’s such an exciting filmmaker to track. Though there may be aesthetic and thematic similarities, his movies are never quite what’s expected and he bounces from genre to genre with aplomb. Okja premieres at Cannes tomorrow and hits Netflix on June 28. There have been reports it will get a theatrical run, but there haven’t been any concrete details about that yet.